Henry Charles Weihe was born on September 16, 1847, in Saxony, Germany. He was a Sergeant in Company M who participated in the valley fight and was wounded during the hilltop fight during the Battle of the Little Bighorn. Algernon Emory Smith (left) was born on September 17, 1842, in Newport, New York. He was a First Lieutenant in command of Company E who died with Custer’s Column. The Treaty of Fort Laramie was concluded on September 17, 1851. When it was brought before the Senate for ratification, certain amendments were made that required the assent of the Tribes. The assent was not obtained, so its validity was questioned. James Montgomery Bell died in Hermosa Beach, California, on September 17, 1919, and was buried in the San Francisco National Cemetery (The Presidio). He was a First Lieutenant of Company D who was on leave at the time of the battle. James Lawler died on September 18, 1877, at Canyon Creek, Montana Territory. He was a Private in Company H who was not present at the Battle of the Little Bighorn due to detached service. Ferdinand Widmayer died in Riverton, New Jersey, on September 18, 1913, and was buried in the Epworth United Methodist Cemetery in Palmyra, New Jersey. He was a Private in Company M who was not present at the battle due to detached service. George W. Glenn died on September 18, 1914, in Richmond, Virginia, and was buried in the Hampton National Cemetery in Hampton, Virginia. He was a Private in Company H who participated in the hilltop fight. David McWilliams committed suicide on September 19, 1882, at Fort Meade, South Dakota, and was buried in the Fort Meade National Cemetery. He was a Private in Company H who was not present at the battle due to being shot in his leg while aboard the Far West. George Anderson died of lip cancer in Minneapolis, Minnesota, on September 19, 1912, and was buried the next day in the Minneapolis Pioneers and Soldiers Memorial Cemetery, which is also known as Layman’s Cemetery. He was a Private in Company K who was not present at the battle due to detached service. Alexander Browne Bishop died on September 19, 1935, in Brooklyn, New York, and was buried in The Evergreens Cemetery in Brooklyn, Kings County, New York. He was a Corporal in Company H who was wounded in the hilltop fight. John A. Bailey was born in Jo Daviess County, Illinois, on September 20, 1847. He was a Saddler with Company B who was with the pack train and participated in the hilltop fight. Jacob Horner (left) died of a respiratory infection on September 21, 1951, in Bismarck, North Dakota, and was buried in St. Mary’s Cemetery there. He was a Private in Company K who was not present at the battle due to detached service. James E. Moore was born on May 6, 1849, in Hebron, Ohio. He was a Farrier with Company B who was with the pack train and later participated in the hilltop fight during the Battle of the Little Bighorn. Charles Clinton Barnett was born on May 7, 1857, in Camden, Ohio. He was a Private in Company G who was not present at the battle due to detached service. Treaty of Fort Laramie with the Crow Tribe was concluded on May 7, 1868. John Fitzgerald died in New York City on May 7, 1900. He was the Farrier for Company C who participated in the hilltop fight. Soldier, an Arikara Scout, died on May 7, 1921, and was buried in the Indian Scout Cemetery in McLean County, North Dakota. His gravestone states, “Served his country as an Indian Scout.” He was with Reno’s Column, but he did not cross the river. Good Elk (Wah-nee), an Arikara Scout who was also known as Red Bear, died in Nishu, North Dakota, on May 7, 1934. He participated in the valley fight. Charles Sanders was born on May 8, 1842, in Altenberg, Germany. He was a Private in Company D who served as the Orderly for Lt. Edgerly and participated in the hilltop fight. Edward Garlick was born in Chertsey, England, on May 8, 1846. He was the First Sergeant for Company G who was on furlough at the time of the battle. Jeremiah Campbell died on May 8, 1884, in Decatur, Illinois, and was buried in Westside Cemetery in Moweaqua, Shelby County, Illinois. He was a Sergeant in Company K who participated in the hilltop fight. Buffalo Bill’s Wild West show opened in London on May 9, 1887, and featured some Indians who participated in the Battle of the Little Bighorn. Jasper Marshall died in Pleasant Hill, Ohio, on May 9, 1920, and was buried in the Pleasant Hill Cemetery. He was a Private with Company L who was with the pack train and participated in the hilltop fight. The Treaty of Fort Laramie with the Northern Cheyenne and Northern Arapahoe was concluded on May 10, 1868. William Earl Smith died on May 10, 1918, in South Deerfield, Franklin County, Massachusetts, and was buried in the Brookside Cemetery there. He was a Corporal with Company B who was with the pack train and was wounded during the hilltop fight. Charles Henry Bishop was born in Washington, D.C., on May 11, 1854. He was a Private with Company H who was wounded during the hilltop fight. Francis Johnson Kennedy (left), who was also known as Francis Johnson, was born on May 12, 1854, in Pacific, Missouri. He was a Private in Company I who was with the pack train and participated in the hilltop fight. Thomas H. Rush, who was also known as Thomas Morton, was born on November 19, 1841, in Greenville, Ohio. He was a Sergeant in Company D who was at Fort Lincoln during the campaign due to illness. Paul Schleiffarth died on November 19, 1896, at Fort Thomas, Kentucky. He was a Private in Company F who was not present at the Battle of the Little Bighorn due to detached service at the mouth of Rosebud Creek. Frank J. Geist died in Minneapolis, Minnesota, on November 20, 1918, and was buried in Lakewood Cemetery there. He was a Private in Company G who was not present at the battle due to detached service. Stephen Cowley (right) died on November 21, 1886, in Larimore, Grand Forks County, North Dakota, and was buried in the Bellevue Cemetery there. He was a Private in Company D who was on detached service at Yellowstone Depot during the battle. George Blunt died on November 23, 1905, at the Joyce Hotel in Baltimore, Maryland. His death was ruled a suicide by gas asphyxiation. He was buried in the Loudon Park Cemetery in Baltimore. He was a Private in Company K who participated in the hilltop fight. Charles Henry Campbell died on November 25, 1920, in Bismarck, North Dakota, and was buried in St. Mary’s Cemetery there. He was a Private with Company B who was with the pack train and in the hilltop fight. Algernon Emory Smith was born on September 17, 1842, in Newport, New York. He was a First Lieutenant in command of Company E who died with Custer’s Column. James Montgomery Bell died in Hermosa Beach, California, on September 17, 1919, and was buried in the San Francisco National Cemeter (The Presidio). He was a First Lieutenant of Company D who was on leave at the time of the battle. George W. Glenn died on September 18, 1914, in Richmond, Virginia, and was buried in the Hampton National Cemetery in Hampton, Virginia. We was a Private in Company H who participated in the hilltop fight. Jacob Horner died of a respiratory infection on September 21, 1951, in Bismarck, North Dakota, and was buried in St. Mary’s Cemetery there. He was a Private in Company K who was not present at the battle due to detached service. Charles Henry Bischoff was born in Bremen, Germany, on September 23, 1855. He was a Private in Company C who was not present at the battle due to detached service. Daniel Newell died of gangrene on September 23, 1933, at Hot Springs, South Dakota, and was buried in Bear Butte Cemetery in Sturgis, South Dakota. He was a Private in Company M who participated in the valley fight and was wounded in the hilltop fight. Jeremiah Campbell died on May 8, 1884, in Decatur, Illinois, and was probably buried in Westside Cemetery in Moweaqua, Shelby County, Illinois. He was a Sergeant in Company K who participated in the hilltop fight. 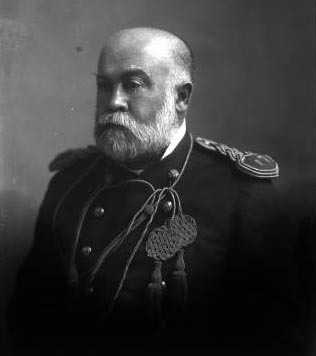 Charles H. Bishop was born in Washington, D.C., on May 11, 1854. He was a Private with Company H who was wounded during the hilltop fight. Jacob Adams died in Vincennes, Knox County, Indiana, on May 13, 1934, and was buried in Mt. Calvary Catholic Cemetery there. He was a Private with Company H who was with the pack train and participated in the hilltop fight. Stephen Cowley was born in Sligo County, Ireland, his father was Michael Cowley, a butcher. He married Bridget Agnes Moore on January 21, 1871 in County Mayo, Ireland. He immigrated in the Spring of 1871 to the United States and immediately registered in the United States Army for the Civil and Indian Wars. He served with General Custer in Company B which was assigned the responsibility of guarding the pack train. His service continued and he was discharged from the Cavalry on September 10, 1882 at Fort Totten, North Dakota. . . .
Alexander Bishop was born on November 22, 1853, in Brooklyn, New York. George Gaffney died in Washington, D.C., on November 22, 1916. Charles Braden was born on November 23, 1847, in Detroit. William Slaper was born on November 23, 1854, in Cincinnati. George Blunt died on November 23, 1905, at the Joyce Hotel in Baltimore. Augustus DeVoto died on November 23, 1923, in Tacoma, Washington. Charles A. Campbell died on November 25, 1920, in Bismarck, North Dakota. Joseph Tilford was born in Georgetown, Kentucky, on November 26, 1828. William Morris died in New York City on November 26, 1933. Hiram Sager was born on November 27, 1850, in Westport, New York. The Battle on the Washita was on November 27, 1868. See the books below for more about this infamous battle.